The Park Hyatt Mendoza is the epitome of luxury and style. With high speed internet access, dual phone lines, cable/satellite TV, safe-deposit boxes, mini-bar, 24 hour room service, and a 24 hour concierge service, this hotel strives to and successfully accommodates the needs of any traveler. Additional guest services include a two story casino, a fully equipped spa and gymnasium, an outdoor pool, a garden, and a sun deck, as well as a range of outdoor activities including rafting, trekking, sport fishing, mountain biking, horseback riding, rock climbing, and snow skiing. With its signature style of elegant indulgence, the Sheraton Mendoza is one of the finest hotels in town, reflecting the city’s sophistication in its sleek designs and graceful décor. Guest rooms are designed to the highest standards of comfort and luxury while the hotel itself offers the very best facilities including a heated pool and fully equipped fitness centre, as well as a range of dining options including the renowned El Mirador Restaurant, serving both the finest international cuisine and local delicacies. A stay in this highest quality Argentina hotel is an excellent way to explore the delightful city of Mendoza during your memorable Argentina vacation experience. The four star boutique hotel Huentala is ideally located in the heart of Mendoza, only a short walk from the central square, Plaza Independencia, and from all the city center’s fine restaurants and bars. The hotel recently underwent a complete redesign with a beautiful transformation of the architecture, rooms and decoration. It features 44 classic rooms, 20 suites with full lounge facilities and 1 presidential suite. There are also interconnected rooms for families if requested. The hotel offers a number of premium comforts for guests including free wireless, room service, a Jacuzzi, swimming pool and fitness center and even pillow menu to help you get a full night's sleep. For people with families there are baby sitter facilities. Just a few blocks away from the city’s commercial center and just opposite the picturesque Plaza Italia, lies the wonderfully appointed and elegant Executive Hotel Park Suites. A tastefully-decorated lobby with marble finished countertops and dark wood lamp tables compliment the elegant décor of the 77 rooms. All spacious and luxurious, rooms come with an LCD screen television set, high-speed internet availability, an individually regulated cooler and heater and a mini-bar. Premiere Suites are available in a “wine theme” where the room features an Argentine wine motif with tasting kits available for the guests to use, tables and wall art complimenting the theme and a variety of wine samples available in the mini bar. This excellent hotel also counts with a swimming pool where guests can take a relaxing dip, Las Bodegas Restaurant that specializes in Mediterranean cuisine, and a relaxing sauna. The friendly staff at this first-rate hotel is always on the look out to satisfy guests’ every needs. Hotel Aconcagua features an impressive lobby and 162 spacious rooms dotted with nice views of the city or of the Andes according to the category. The hotel has a small yet attractive pool and deck area which is very popular in summer. The main restaurant welcomes guests with an innovative menu and very friendly service. All rooms are comfortable, stylish and well-appointed with all modern amenities, including safe boxes, internet, minibar and more. The Urbana Class is a luxurious hotel located just a short walk from the central Plaza Independencia at the heart of Mendoza. The hotel has a fresh modern design that provides all of the comforts you would need for your stay. There are 46 six rooms all with air conditioning, heating, and a refrigerator. There are single, double and larger rooms available on request. The hotel also features wifi internet access, a gym and a heated outdoor swimming pool to enable you to relax, perfect after a day out wine tasting in the region. Recently opened, El Portal Suites is located in front of the most beautiful square in Mendoza, Plaza Chile, in a modern building providing huge comfortable rooms with internet, telephone, hairdryer, kitchenette, mini bar, safe box and work area. The Hotel NH Cordillera is located in the heart of Mendoza, close to the main square and a short walk from the shopping district. It offers 105 well designed and pleasantly decorated rooms as well as a fitness center including an on-staff physical therapist, a sauna, a swimming pool. The delicious restaurant features specialties influenced by Spanish, French and Argentine cuisine. Located just one block from the famous Pedestrian Street and just 20 minutes from the airport, the excellent Gran Hotel Medoza offers 80 modest rooms with minibar, safe-deposit box, A/C and TV. The hotel has a Spa & Health Centre with Jacuzzi, massage service, sauna and gym. Its restaurant called “El Mirador” (“Lookout Point”) provides a good service and a great view of the city as it is placed on the top of the building. A few short blocks from the Mendoza’s main plaza, Plaza Independencia, Condor Suites is a great choice if you’re looking for lodging with spacious rooms. The minimally-decorated suites feature kitchenette areas and ample living room space, depending on what your party may request. Services include cable TV, a mini-bar, individual heating and air-conditioning. The hotel staff is especially helpful and always ready to help you find information on activities you may wish to do in this city, which is renowned for its wineries and mountain expeditions. Located in downtown Mendoza, just a stone’s throw from the main plaza and minutes from the city’s main shopping outlets and restaurants, the Villaggio Hotel Boutique offers convenience, as well as comfort. “Villaggio”, meaning “village” in Italian, sees the country’s influence reflected in the design and decoration of its 26 rooms. All are fully-equipped with a flat-screen TV, mini-bar, Wi-Fi availability, and heating and air-conditioning, among other amenities. Services include a buffet breakfast, a roof-top gym with an amazing view of the city, and saunas and Jacuzzis available to soak in after a long day of sight-seeing. 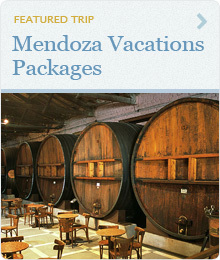 Located on the outskirts of the city of Mendoza, Club Tapiz offers a cozy and quiet lodging experience. The property, built in 1890 and surrounded by beautiful vineyards, has been renovated but still respecting the villa’s beautiful architecture. The club offers 7 luxurious rooms, all modernly decorated, some with beautiful views of the Cordillera Andes mountain range. Guests are invited to visit the nearby winery or take advantage of the pool and garden areas during the summer.